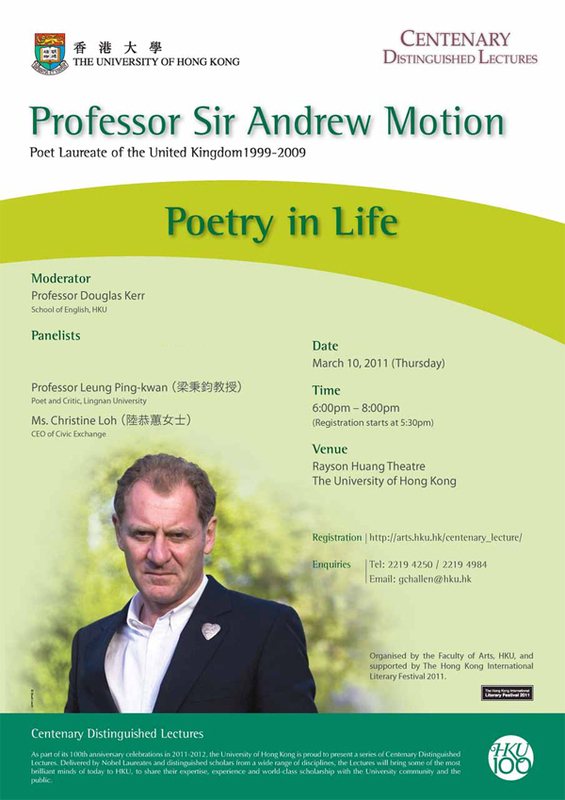 Andrew Motion is an English poet, novelist and biographer, who presided as Poet Laureate of the United Kingdom from 1999 to 2009. His new book "Laurels and Donkeys" (November 2010) is a sequence of war poems referring to 20th- and 21st-century conflicts that have involved British forces. He has been Chair of Arts Council England's Literature Panel since 1996. He was knighted in the 2009 Queen's Birthday Honours list. As part of its 100th anniversary celebrations in 2011-2012, the University of Hong Kong is proud to present a series of Centenary Distinguished Lectures. Delivered by Nobel Laureates and distinguished scholars from a wide range of disciplines, the Lectures will bring some of the most brilliant minds of today to HKU, to share their expertise, experience and world-class scholarship with the University community and the public.